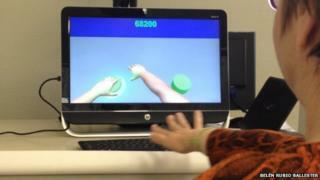 Virtual reality could help stroke patients recover by "tricking" them into thinking their affected limb is more accurate than it really is. Researchers in Spain found that making the affected limb appear more effective on screen increased the chance the patient would use it in real life. This is important because stroke victims often underuse their affected limbs, making them even weaker. A stroke charity welcomed the study and called for more research. In the study of 20 stroke patients, researchers sometimes enhanced the virtual representation of the patient's affected limb, making it seem faster and more accurate, but without the patient's knowledge. After the episodes in which the limbs were made to seem more effective, the patients then went on to use them more, according to lead researcher Belen Rubio. "Surprisingly, only 10 minutes of enhancement was enough to induce significant changes in the amount of spontaneous use of the affected limb," said Mrs Rubio from the Laboratory of Synthetic, Perceptive, Emotive and Cognitive Systems at Pompeu Fabra University in Spain. "This therapy could create a virtuous circle of recovery, in which positive feedback, spontaneous arm use and motor performance can reinforce each other. Engaging patients in this ongoing cycle of spontaneous arm use, training and learning could produce a remarkable impact on their recovery process," she said. There was an average chance of 35% that the 20-patient group chose their paretic (partially paralysed) arm to reach for something straight in front of them before the virtual reality enhancement, but an average chance of 50% afterwards, which is the same as for a healthy person. Professor Paul Verschure, an author of the study and leader of the research group, told the BBC News website that there was now a long-term follow-up planned to see the effects of the experiment on the patients in their everyday lives. The Stroke Association said physical rehabilitation can help rewire a stroke victim's brain. "The results of this pilot study suggest that the power of virtual reality could be used in the future to help stroke patients build confidence in using their weakened limb, and therefore promote their recovery. Larger trials are needed establish whether this is possible," said Dr Shamim Quadir, research communications manager at the Association.